He was Governor, Andhra Pradesh from 24th November, 1997 to 3rd January, 2003. He was Governor, Reserve Bank of India between December 22, 1992 and November, 1997.During this period besides making monetary policy a flexible instrument of economic policy in achieving growth and price stability, Governor Rangarajan gave a major thrust to financial sector reforms. Among the financial sector reforms that have received impetus include simplification and deregulation of interest rate structure, reorientation of reserve requirements with a view to improving banks’ lendable resources, strengthening the soundness of banks through the institution of internationally accepted prudential norms and an improved supervision system, upgradation of information technologies and imparting a greater element of competition in the financial system. The agreement between the Government of India and Reserve Bank on the institution of Ways and Means Advances has provided the central bank of the country greater autonomy in the conduct of monetary policy.He was a Member of the Planning Commission, Government of India, from 21 August 1991 to 21 December, 1992. During this period, he played an important role in the formulation of the Eighth Five Year Plan which had to acquire a new orientation in the context of the changes in economic policy. He was also for a brief period Member, Tenth Finance Commission. The changes in the exchange rate management culminating in the unified market determined exchange rate mechanism were made on the recommendation of a Committee of which he was the Chairman. He held the position of Deputy Governor, Reserve Bank of India, for almost a decade from 12 February 1982 to 20 August 1991. During this period, he was instrumental in bringing about a number of changes in the credit and financial system, both in terms of induction of new instruments and new institutions. After obtaining his Honours Degree from Madras, he went to the University of Pennsylvania wherefrom he took his Ph.D degree in Economics. In the U.S., he has taught at the Wharton School of Finance & Commerce, University of Pennsylvania and the Graduate School of Business Administration, New York University. In India, he has taught at Loyola College, Madras; University of Rajasthan, Jaipur; Indian Statistical Institute, New Delhi and for well over a decade and a half at Indian Institute of Management, Ahmedabad. He was for a time Fellow at the International Food Policy Research Institute, Washington. Select Essays on Indian Economy (2003). He was a member of the Economic Advisory Council for the Prime Minister between 1985 and 1991. 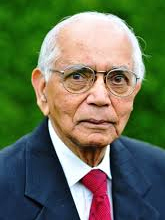 He was President of the Indian Economic Association in 1988 and President of the Indian Econometric Society in 1994. He was the Chairman of the National Statistical Commission which was set up to reform the Indian Statistical System. Awarded PADMA VIBHUSHAN by the President of India in January, 2002.